My goal is to share as much information and guidance as possible in an easygoing, nurturing environment. I want to help each participant improve their playing ability and technical skills, and deepen their knowledge of music, regardless of where they’re starting from. And most importantly, to have fun throughout! All instruments are welcome in the jazz ensemble. I welcome strings of all stripes – guitars, basses, mandolins, fiddles, cellos, etc.. also woodwinds, horns, and keyboards. Some knowledge of music theory would be helpful. Ability to play arpeggios of those chords would be wonderful. Kudos in advance to anyone who knows the traditional modes – Ionian through Locrian – and Diatonic Chords formed by a major scale: Imaj7 II-7 III-7 IVmaj7 V7 VI-7 VII-7b5, but don’t worry if this stuff is unfamiliar. Knowledge of common scales would be helpful – major, relative minor, major and minor pentatonic, blues scale, etc.. We’ll play a lot of scales and arpeggios together and learn how to apply them in our soloing. Familiarity with “real book” charts, the chords in jazz standards or 12 bar blues is desirable. Accomplished classical and orchestral players interested in jazz theory and improvisation are welcome and encouraged to participate! 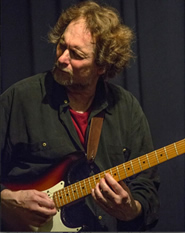 Paul Renz teaches guitar, bass, and jazz ensembles at MacPhail Center for Music in Minneapolis, Minnesota. He recently retired as director of jazz studies at the West Bank School of Music in Minneapolis where he headed the jazz program for 23 years. Paul performs regularly at jazz clubs in the midwest and tours nationally every other year. He has composition and jazz studies degrees from New England Conservatory and Berklee College of Music. He’s been a featured guitarist and composer on National Public Radio. His works have been commissioned by Tidewater Performing Arts Society of Virginia, Tidewater Classic Guitar Society of Virginia, the Minnesota Center for Arts Education, MacPhail Center for Music and Roseville Area High School. Renz has conducted jazz workshops across the United States and Canada. Renz’s latest CDs, In My Own Hands and ReBop feature original compositions and are available through his website. Renz’s CD Beyond Blues won the “Excellence In Music Award,” Minnesota Monthly’s Best of Minnesota edition. The Silesian Philharmonic Orchestra of Poland recorded Renz’s A Symphonic Poem (Robert Black Conducts) in 1992. Paul is delighted to be instructing at the 2019 Blue Skies Adult Music Camp, and he offers his own Jazz Camp on Upper Rideau Lake near Westport, Ontario every summer.